Arroyo Bridge Books, 9780984784684, 384pp. 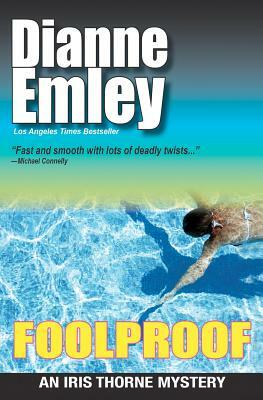 Foolproof is the fourth in the critically acclaimed Iris Thorne mystery series by Los Angeles Times bestseller Dianne Emley, now available as a trade paperback. Includes bonus: the first chapter of Pushover, the fifth Iris Thorne mystery. From where she stands in her newly purchased beachfront bungalow--complete with cozy garage for her beloved red Triumph convertible--life looks good for investment counselor Iris Thorne. The only clouds on her horizon are her boss from hell and the never-ending office battles at McKinney Alitzer. But one hot night, everything changes. Her dear friend Bridget is brutally murdered next to her backyard swimming pool, and the sole witness is Brianna, her five-year-old daughter. The primary suspect is Bridget's husband, Kip--the volatile creative genius behind the couple's computer games company, Pandora. Bridget surprised everyone--especially Kip--when she left her majority stake in Pandora not to her husband, but to her daughter. And she named Iris as administrator of Brianna's trust. Suddenly, Iris must deal with conflicting emotions as the evidence mounts against Kip and she finds herself responsible for the financial future of a little girl--and maybe even the five-year-old's life. Exposing the deadly tensions behind the glamorous facades of Brentwood mansions and laying bare the riddles along a dark stretch of the Pacific Coast Highway, Dianne Emley has marked the L.A. mystery with a style all her own. And with "her bold moral compass, her appealing in-your-face attitude and unsettled romantic life, Iris is a compelling heroine" (Publishers Weekly) who "deserves our undivided attention" (Los Angeles Times Book Review). Dianne Emley is a Los Angeles Times bestselling author and has received critical acclaim for her books which include the Detective Nan Vining thrillers: The First Cut, Cut to the Quick, The Deepest Cut, and Love Kills and the Iris Thorne mysteries: Cold Call, Slow Squeeze, Fast Friends, Foolproof, and Pushover. Her books have been translated into six languages. A Los Angeles native, she lives in California with her husband. Learn more at DianneEmley.com.